Chimera is excited to announce its newest addition to the POP bank range; The POP bank Small for Litepanels Astra and other 1×1 Fixtures. The POP bank Small expands the range of POP banks for 1×1 fixtures. The POP bank Small requires no mounting hardware or frame, and simply slides over the front of your fixture, allowing for portability and ease of use. With an increased front aperture size and the ability to be used vertically or horizontally. The POP bank Small is a versatile tool for any lighting professional’s kit. The POP bank Small is lightweight, collapsible and handmade in Colorado to Chimera’s high quality standards The Pop Bank Small uses Chimera standard small size front screens and increases the aperture of a 1×1 LED panel style fixture to 24” x 32” (607 mm x 83 mm). The POP Bank Small will be sold as a kit, with grid-less front screens in Full and Half, packed in a messenger style kit bag. The POP bank Small is competitively priced and available NOW from Chimera dealers worldwide. CHIMERA has been providing high quality light modifying products to the motion picture, video and still photography community worldwide since 1980. Chimera products are lightweightand portable and can turn your hard light into a beautiful broad, diffused light sourcewithin minutes. Chimera products include Lightbanks, Strip Banks, Mini and MaxiBanks, OctaPlus Banks, Panels and Frames, Lanterns, and Speed Rings. 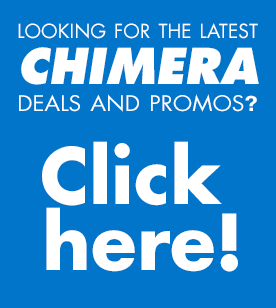 For additional information on CHIMERA’s LightingProducts and your nearest dealer, visit www.chimeralighting.com. At Cinegear 2018, Chimera Lighting is proud to launch its new range of Lightbanks: [POP] banks. These Lightbanks are designed specifically for the newer square and rectangular LED fixtures. [POP] banks do not require a Speed Ring for mounting. Chimera Lighting in partnership with LiteGear is excited to launch its newest product; the Panel Lantern, Powered by LiteGear. At NAB, Chimera Lighting is pleased to be introducing a frameless Lightbank and a lantern for the Fluotec Cinelight 60. The Lightbank is lightweight, collapsible and handmade in Colorado to Chimera’s high quality standards. The Lightbank uses Chimera standard small size front screens and increases the aperture of the Fluotec Cinelight 60 to 24” x 32” (607 mm x 83 mm). The Lightbank (p/n 1629F) will be sold as a kit, with grid-less front screens in Full and Half, packed in a messenger style kit bag, all weighing less than 2 lbs (0.9 kg). The SkyPanel Lanterns feature beautiful omnidirectional lighting for the popular Arri Skypanels. Chimera Lanterns are recognized for their ease of use and this lantern is no different. These lanterns provide easy control when placing light fixtures overhead. The included skirt easily attaches to enable control over the bean and spill. The skirt can be rolled up or down using the zippers and Velcro on all four sides to vary the beam spread from an omnidirectional source. ARRI skies are bright with the new Chimera Lightbank for the ARRI SkyPanel S120. Building on the highly regarded and previously available Chimera Lightbanks for the ARRI SkyPanel S30 and S60 Tech Lightbanks, Chimera has broadened support for ARRI’s professional SkyPanel LED lighting systems to the largest available model in the line, the ARRI Sky Panel S120 Tech Lightbank (model #1649), and the Universal Mounting Brackets (model #1601).